Although measuring a hysteresis loop can be helpful in the magnetic characterization of materials, this approach does not provide information of interactions or coercivity distributions. First-order reversal curves (FORC) can be used to determine the relative proportions of reversible and irreversible components of the magnetization of a material. FORC facilitates analyzing irreversible interactions in arrays of magnetic nanowires, nanoparticles, or nanodots caused by coupling between adjacent particles, dots, or wires. This article discusses some of the currently used techniques in the characterization of magnetic materials. Magnetic nanoparticles, nanodots and nanowires are an interesting class of materials, because of the novel properties conferred by having at least one dimension in the nanometer range. Applications of these magnetic nanomaterials include high density recording media, spintronics, drug delivery and medical diagnostics, amongst many others. They also represent an opportunity for fundamental studies into the properties and mechanisms of magnetism on the nanoscale. When analyzing the magnetic interactions in nanostructured magnetic materials, one fascinating configuration is periodic arrays of magnetic nanowires, due to the possibility of controlling the size and arrangement of the wires. Inter-wire coupling is a key effect in nanowire arrays as it greatly affects microwave and magneto-transport properties as well as magnetization switching. Hence, it is necessary to have a method capable of analyzing the strength and quantifying the effect of these interactions. This is achieved by utilizing a magnetometry technique, which measures and interprets FORCs. The magnetic response of a material varies in proportion to its intrinsic magnetism and its volume being measured. For nanoscale magnetic materials, the signal quantified by a magnetometer is very low due to the involvement of very small sample volume. Therefore, sensitivity is the key parameter for the magnetometry technique to characterize nanostructured magnetic materials. In addition, measurement speed is another important parameter because of the involvement of thousands of data points in FORC measurements. Inductive and force-based are the two broad categories of the magnetometry techniques. Common inductive techniques include AC susceptometry and superconducting quantum interference device (SQUID) magnetometry, extraction magnetometry, and vibrating sample magnetometry (VSM) . SQUID based magnetometers measure the magnetic properties of materials using superconducting detection coil circuitry and quantum mechanical effects. SQUIDs can theoretically achieve sensitivities of 10-12emu, but their practical limit is 10-8emu due to environmental noise. SQUIDs can make measurements from low to elevated temperatures (<2K to 1000K), and to field strengths of 7T using superconducting magnets. However, they require more time to complete a measurement owing to the rate at which the magnetic field can be changed. VSM involves vibration of a magnetic material within a uniform magnetic field H, generating an electric current in properly placed sensing coils. The resulting voltage developed in the sensing coils varies in proportion to the magnetic moment of the sample. An electromagnet or a superconducting magnet may generate the magnetic field. Cryostats and furnace assemblies are used to attain variable temperatures from cryogenic to high temperatures (<4K to 1273K), respectively. Commercial VSM systems use conventional electromagnets, providing measurements to field strengths of ~3T. Systems using superconducting magnets are able to generate fields up to 16T. The use of electromagnets allows for very small step changes in the magnetic field and very fast measurements. The use of superconducting magnets provides higher field strengths, but limited field setting resolution and inherently slow measurement speed. Commercial VSM systems have an ultimate noise floor of 10-7emu, which is sufficient to characterize many magnetic materials but may be inadequate for proper characterization of nanoscale magnets. where m is the magnetic moment. These force methods require a balance for force measurements and an electro- or superconducting magnet. Alternating gradient magnetometers (AGM) apply force methods in a commercial platform, and can achieve sensitivities in the 10-8 to 10-9 emu range. They can make very fast measurements. Commercial AGM systems can be utilized to measure ambient and low temperatures (~10K to 300K), with the moderate 2T to 3T fields that can be achieved with electromagnets. Figure 1 presents a series of FORCs determined for a periodic array of Ni nanowires utilizing Alternating gradient magnetometry. The results demonstrate the AGM's excellent measurement speed, as the FORC curves involve 4640 points, and were measured within just 20 min. Figure 2 presents the analysis results of these FORC curves, yielding the local interaction Hu and coercive Hc field distributions. This approach provides additional data pertaining to irreversible magnetic interactions or processes in this series of nanoscale wires. This is not possible with a standard hysteresis loop measurement. Figure 1. First-order-reversal-curves (FORC) for an array of magnetic nanowires. 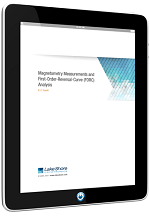 Magnetic measurements are imperative in the characterization of the magnetic properties of nanoscale magnetic materials. Such measurements can be performed using magnetometry techniques. This article covered the more common inductive and force-based magnetometry techniques as well as their advantages and drawbacks. The selection of the appropriate technique is based on the materials being measured; practical considerations, including measurement speed and sensitivity; and the parameter space such as field and temperature over which measurements are being performed. 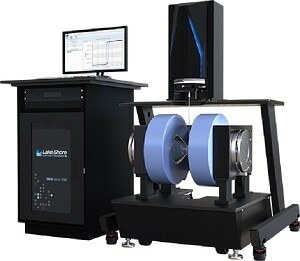 Supporting advanced research since 1968, Lake Shore is a leading innovator in measurement and control solutions for materials characterization under extreme temperature and magnetic field conditions. High-performance product solutions from Lake Shore include cryogenic temperature sensors and instrumentation, magnetic test and measurement instruments, probe stations, and precision materials characterizations systems that explore the electronic and magnetic properties of next-generation materials. Lake Shore serves an international base of research customers at leading university, government, aerospace, and commercial research institutions and is supported by a global network of sales and service facilities.